The design of planetary atmospheric entry vehicles places substantial emphasis on making accurate predictions of aerodynamic performance and heating environments during the various stages of the entry process, but the costs of testing those items under actual flight conditions are huge. At the same time, recreating the corresponding flight conditions on the ground is an extremely challenging venture. 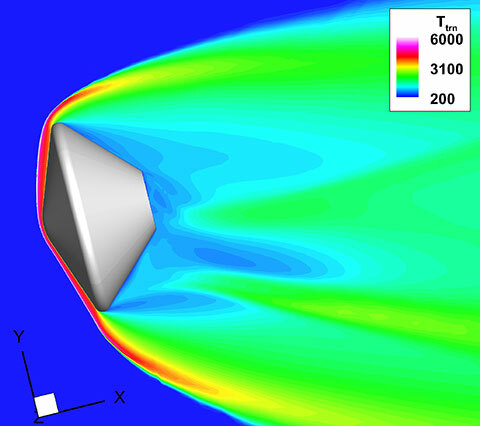 In response to these difficulties, JAXA developed design tools and evaluation/testing technology for the aerothermodynamic design of planetary atmospheric re-entry vehicles. These tools and technologies use numerical analysis technology which bridges the gap between ground-based tests and actual flight conditions and allows users to obtain the same results as they would from flight tests. By systemizing the tools, JAXA has completed an aerothermodynamic evaluation system for planetary atmospheric entry vehicles. This technology has been used to construct a testing environment for the small return capsules and Mars landing probes which are being considered at JAXA. It is now necessary to further enhance the technology by improving accuracy, reliability and usability. The technology will also be used in the testing of free-flying objects and in advanced aerothermodynamic design (decreasing the weight of thermal protection systems, realizing optimal aerothermodynamic design, and predicting catastrophic events in contingencies). Enhancing (expanding functionality and scope) aerothermodynamic evaluation systems (software and hardware) which are required to realize future atmospheric entry missions by JAXA. Supporting the development of missions (small return capsules, Mars landing probes, etc.) which use the systems described in 1. Using the systems described in 1 to advance research aimed at producing world-leading and world-first academic results. Through these efforts, JAXA will make progress on solutions in the area. 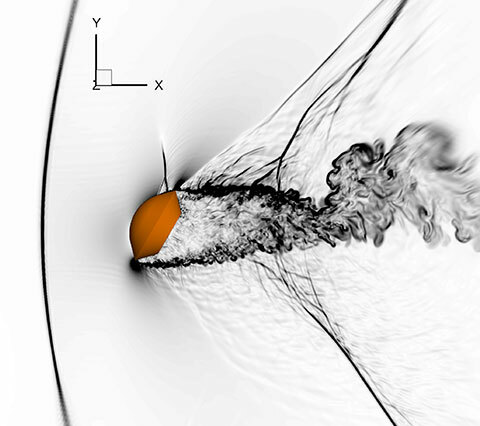 JAXA developed a thermochemical nonequilibrium flow analysis code, named JAXA Optimized Nonequilibrium Aero-THermodynamic ANalysis (JONATHAN), for predicting the aerodynamic performance and heating environment in a hypersonic flight during atmospheric entry. When flying at a speed exceeding 5 to 7 km/s, the flow around the capsule achieves very high temperature, which induces excitation of internal energy modes, thermal dissociation, and ionization of nitrogen and oxygen molecules. Such a flowfield is called thermochemical non-equilibrium flow. We are promoting JONATHAN for greater versatility so that users with inadequate expertise can analyze thermochemical non-equilibrium flows. In addition, while incorporating the latest research results of JAXA into JONATHAN, we are attempting to develop it into a more sophisticated tool. Structured Package for RADIation ANalysis (SPRADIAN) is a tool for radiation calculation developed to evaluate the radiative heating environment of the reentry capsule as a part of the asteroid sample return mission (HAYABUSA) planed by the Institute of Space and Astronautical Science of JAXA. It is a package containing the spectroscopic database and radiation transport calculation codes. SPRADIAN can calculate the emission and absorption coefficients for a medium of a certain temperature and density distribution and solve for radiation transport in the medium. 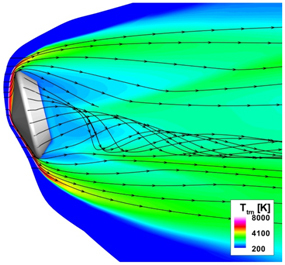 For example, the flow around the reentry capsule can be analyzed by JONATHAN, and SPRADIAN can evaluate the radiative heating on the capsule surface using that flow data. In addition, SPRADIAN can be applied to determine the physical quantities (temperature and species composition) of the flowfield in the shock tube and shock tunnel using experimental data. The radiation spectrum, which is expected to be observed in experiments, can also be predicted by the combined use of SPRADIAN and flow calculation.